WHAT has scales and comes in a cup with a gourmet twist? 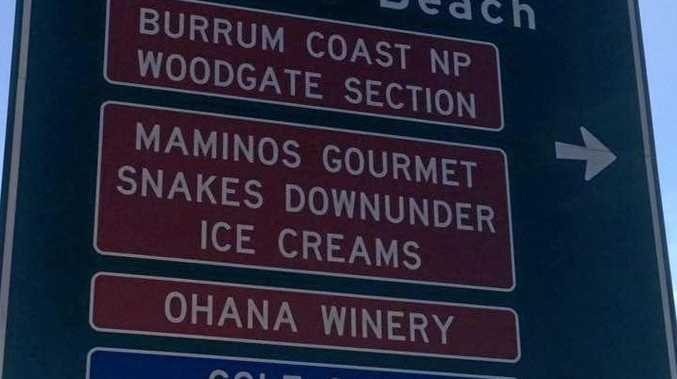 "Maminos Gourmet Snakes Downunder Ice Creams" right? A new sign erected outside Childers Gateway Motorway Inn has spectacularly jumbled two of the town's biggest drawcards and even misspelt one of them. Mammino Gourmet Ice Creams made light of the situation in a post on social media. "Our neighbours on the same road as our factory are Snakes Downunder Reptile Park and Zoo, but we've never thought of teaming up with them to make a new flavour of ice cream," their post read. The mishap has been the source of much discussion online, with some finding the hilarity and others disappointed by the error. Member for Burnett Stephen Bennett said the mistake had caused "quite a stir with locals, as you can imagine". "While Mammino Gourmet Ice Cream and Snakes Downunder are equally popular destinations for visitors and locals alike, I don't think they are looking to strike up a partnership to create a new flavoured ice cream featuring reptiles," Mr Bennett said. "I was quite surprised when locals alerted me to the signage error. "I have requested that the Department of Transport and Main Roads urgently rectify the sign." A Transport and Main Roads spokesperson said the sign was installed on Tuesday at the Bruce Highway and Goodwood Rd intersection as a part of the Pacific Coast Way tourist drive program. "Unfortunately the sign was incorrect," the spokesperson said. "Our contractor is currently manufacturing a plate to install over the incorrect information. "It is expected to be installed within a week."